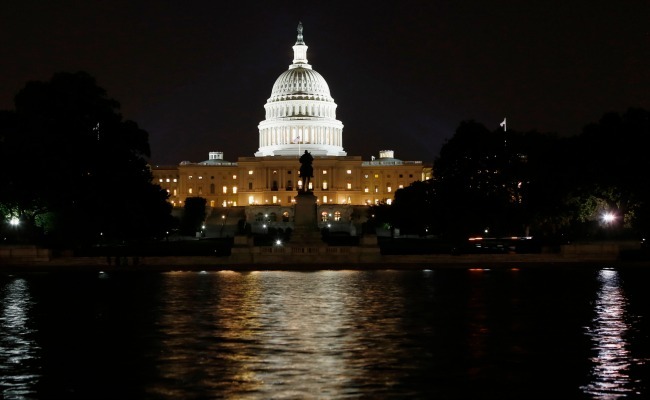 The Senate rejected House Republicans' latest budget bill, setting the stage for the government to close down at midnight. Despite a month of debate and a week of frantic legislative maneuvering, Congress was unable to bridge its fundamental schism: Senate Democrats pledged not to pass any budget bill that cut into Obamacare, and Republicans promised they would reject any bill that didn’t. Neither side blinked, and so — for the first time in 17 years — the federal government will go unfunded. House Republicans’ last-ditch bid to reach a deal collapsed Monday night when Senate Majority Leader Harry Reid rejected their call to negotiate over a GOP bill that would keep the government funded but would bar health-care subsidies for members of Congress, their staffs, the president, his cabinet, and political appointees. Reid rejected the offer, saying he would enter budget negotiations only after the House passed his party’s bill to keep the government open. The House will remain in session until 3 a.m. Tuesday morning, but the sun will rise Tuesday on a closed federal government: Reid shuttered the Senate shortly after midnight, saying his colleagues would not return until 9:30 Tuesday morning. Here’s a full recap of how we got here Monday, as well as the latest updates from the House. As the federal government shut down, shortly after midnight, Senate Majority Leader Harry Reid announced on the floor that the Senate would recess until Tuesday morning at 9:30 a.m. The Office of Management and Budget has sent out a memo calling on federal agencies to "execute plans for an orderly shutdown due to the absence of appropriations." OMB Director Sylvia Burwell called on Congress to "act quickly to pass a Continuing Resolution," but as we've all learned today, that's just a funny joke that isn't yet happening. House Rules Committee Chairman Pete Sessions, R-Tex., said Monday night that House Republicans are hoping to bring all sides to the negotiating table and resolve the two-chamber differences. But even before the committee was to formally vote on the go-to-conference measure, shortly after 11 p.m., Senate Majority Leader Harry Reid, D-Nev., shot it down. The formation of a conference would entail the appointment of some House Republicans and Democrats, and Senate Republicans and Democrats, to hash out budget differences. But the procedures involved – and the negotiations -- could not be accomplished before the shutdown deadline. UPDATE: 11:05 p.m.: Reid: "We Will Not Go to Conference Until We Get a Clean CR"
So says the Senate majority leader on the Senate floor. Speaking of the Republicans, Reid said that "they want to close government." After Reid, Sen. Chuck Schumer came to the floor to back up his leader. "I kind of feel sorry for Speaker Boehner," the New York Democrat sad. Both senators, speaking largely from the same talking points, said that they wouldn't go to a conference with a gun to their collective head. UPDATE: 10:54 p.m. -- Yeah ... we're shutting down. House Majority Leader Eric Cantor tweeted to members that the House will vote tonight on a motion that contains the anti-Obamacare CR amendments they passed earlier this evening and a request for a conference with the Senate. We don't know yet who will be in the conference, or even if the Senate will accept such a deal this late in the game. UPDATE: 10:30 p.m. -- 1.5 Hours to Shutdown: Towards a Conference? A new potential path forward emerged late Monday in the Senate. A bipartisan group of senators tried to forge a new consensus around going to conference with the House late Monday. But in order for that to work, the House and Senate leaders would have to both agree. "What we are trying to figure out is what the House is able to do," Sen. Lisa Murkowski told National Journal. "It's really easy to do Monday morning quarterbacking from here." Asked whether she thinks the group would avert a shutdown she said, "No," but crossed her fingers so a reporter was certain to see. Murkowski also acknowledged that the plan would be politically risky for House Speaker John Boehner. "Boy oh boy, if we had the plan, we'd get it over to the House," she said. The House Rules Committee is scheduled to meet now to discuss a conference. Sen. John Cornyn, the No. 2 Republican in the Senate, said he's heard the House Republicans may volley over yet another bill to fund the government that Senate Democrats would likely reject, this time attaching a provision related to medical device tax in the health care law. Asked if he thought the government would shut down, he told National Journal, "I do." With the continuing resolution back in the hands of the House, Sen. Chuck Schumer, D.-N.Y., said late Monday that it’s time for that chamber’s Republicans to take a leaf out of Peter King’s book. The Republican representative abandoned his party’s plan today and voted to table the House’s latest CR. UPDATE: 9:35 p.m. -- 2.5 Hours Until Shutdown: McCain: Americans "Will Blame Congress"
Sen. John McCain said tonight that Congress will ultimately bear the brunt of public blame if the government shuts down after midnight. McCain, who offered some defense to House Republicans who are still attempting to defund Obamacare because they “campaigned on and said they would go to Washington” to repeal it, also warned that this shutdown could be more severe than previous ones. “The impact of the shutdown of the government, since we haven’t passed a single appropriations bill, will be more immediate and impactful,” McCain said. He maintained that efforts by the House GOP would continue to be fruitless. The Senate voted shortly after 9 p.m. along party lines to table the House CR amendments that delayed the individual mandate for a year and eliminated health care subsidies for some government employees. From here, the House has to decide what to next. While there are some indications that the House could pass yet another anti-Obamacare CR doomed to swift death, there are inklings that House leadership could be preparing to actually pass a clean CR to prevent a shutdown. This is when the night gets fun. UPDATE 8:45 p.m. -- 3 Hours to Shutdown: Next Up in the House? Try Again. The Senate has pledged to vote down House Republicans third continuing resolution aimed at attacking Obamacare, but GOP leadership is already considering a fourth CR that would include cuts to Obamacare, tweets National Review's Jonathan Strong. The House passed its budget resolution 228-201 that includes an amendment that would delay the individual mandate and eliminate health care subsidies for some government employees. Twelve Republicans joined 189 Democrats in opposing the resolution: Mike Rogers, R-Ala., Thomas Massie, R-Kansas, Joe Barton, R-Texas, Charlie Dent, R-Penn., Kay Granger, R-Texas, Pete King, R-N.Y., Paul Broun, R-Ga., Mario Diaz-Balart, R-Fla., Rick Crawford, R-Ala., Steve King, R-Iowa, R-Ga., Louie Gohmert, R-Texas, Michele Bachmann, R-Minn., and Phil Gingrey, R-Ga.
UPDATE: 8:25 p.m. -- 3.5 Hours to Shutdown: King "Blame Cruz for Any Shutdown"
Rep. Peter King (R-N.Y.) has openly broken ranks with his party's plan to again pass budget legislation attacking Obamacare, saying he would vote against Republicans' latest iteration of a continuing resolution—and blasting the highest-profile member of the "Defund Obamacare" movement. Chris Moody of Yahoo writes: "King [said] that if the government did shut down, one man would be responsible. 'Ted Cruz should be blamed,' King said. 'And anybody that follows him.'" The House is now voting on the budget proposal that would delay the individual mandate and strip health care subsidies for some government workers. It's a fifteen minute vote. From there, the bill will likely move to the Senate, where Senate Democrats say they will move to table the House GOP Obamacare amendment and send back a clean CR. President Obama called Majority Leader Harry Reid tonight to discuss funding the government, according to a Senate Democratic aide. Obama told Reid he was "proud of the Democratic caucus for being united and fighting for the affordable care act," the aide said. The comment serves Democratic goals of casting a unified front as Senate and House Republicans have argued about the best approach to gain leverage in the debate over funding the government. UPDATE: 8:12 p.m. -- 4 Hours Until Shutdown: Bachmann: "We Need To Do Something That Will Actually Stop Obamacare"
Rep. Michele Bachmann, R-Minn., one of the six Republicans who voted against the procedural measure to bring the House CR to the floor, explained that she could not support a bill that does nothing to stop Obamacare from taking root tomorrow. "All this bill does -- it's a so-called 'delay' of the individual mandate for one year," Bachmann told reporters after recording her vote. "We need to do something that will actually stop Obamacare from going into effect; this bill does not accomplish that." There were reports that up to 20 House Republicans were orchestrating an attempt to torpedo the bill before it hit the floor. It seemed possible after this afternoon's GOP conference meeting, which saw several conservative members -- and also some moderates -- looking visibly unhappy with leadership's plan. Speaker Boehner took the floor full of energy, demanding that the Senate agrees to his new CR plan in the name of fairness. "All the Senate has to do is say yes and the government is funded tomorrow," he said. The speaker, who has at times struggled to keep his caucus in line, left the floor to applause. Sen. Ted Cruz says he will donate his salary to charity if there's a government shutdown, according to a statement from his office. Cruz is blaming Majority Leader Harry Reid for the shutdown, arguing that the Nevadan is not compromising over Obamacare. "Elected leaders should not be treated better than the American people, which is precisely why hardworking Americans deserve the same Obamacare exception that President Obama has already granted Members of Congress," Cruz said in a statement. Members of Congress, along with the president, presidential appointees and Supreme Court justices, are guaranteed paychecks during shutdowns. Republican representatives from Cruz's state followed in his step quickly, with Blake Farenthold writing Monday night that he asked the House Chief Administrative Officer to withhold his pay, and Bill Flores, saying he would donate each day's pay to reduce the federal debt. A 225-204 vote in favor of the rule for debate on the House CR amendments cleared a possible revolt from moderates who want to prevent a shutdown and conservatives fully opposed to Obamacare. Only six Republicans joined Democrats in opposition. As House Republicans consider inserting a provision to force members of Congress and their staffs to get health insurance through the new Obamacare exchanges set to open Tuesday, the conservative American Action Forum has released a poll of congressional swing districts showing the idea is a winner, at least politically. In the survey, conducted last week, 56 percent of respondents said they would be in favor of including such a provision in a government funding bill. Still, the poll requires some caveats. The survey asked if voters would like to "remove Congress's exemption from Obamacare" -- a loaded phraseology. Still, the survey shows the political potential for Republicans of hammering Congress, as Sen. David Vitter, R-La., has, on the issue of not receiving their health benefits through the new law and its potency in the current government funding fight. For the first time in more than a week, President Obama and Speaker Boehner have had a telephone conversation. That in and of itself doesn't sound like much, but with the shutdown clocks ticking, it may wind up meaning a lot. A collection of centrist House Republicans are threatening to torpedo Boehner's plan to send the Senate a third continuing resolution that attacks Obamacare, National Review reports. The group, led by New Yorkers Peter King and Michael Grimm, wants to avert a shutdown by passing the Senate's budget extension, and they oppose their fellow Republicans' strategy of using the threat of a government shutdown to attack the health care law. "If Obamacare is as bad as we say it's going to be, then we should pick up a lot of seats in the next election and we should win the presidency in 2016," King said Monday. "This idea of going through the side door to take something you lost through the front door—to me, it's wrong." For Boehner, a revolt from moderates would mean attack from all sides. His party's right flank—which has openly defied Boehner on several key votes since their 2010 ascension—says the most recent iteration of the Obamacare attack doesn't do enough to wound the law. With very few hours to go before midnight, Republican Sen. Mike Crapo called into KBLI radio station in his home state of Idaho. He recalled the government shutdowns of 1995 and 1996, and said a similar situation today may not necessarily be a bad thing—at least for the GOP platform. After the last shutdowns, "the Republicans and the president did finally have to come together because there was damage being done and we all felt that the kind of progress we were trying to achieve could be achieved in increments," Crapo said. Progress followed soon after, he said, in the form of a balanced-budget deal in 1997 that conservatives took credit for. Sen. Ted Cruz accused Senate Majority Leader Harry Reid of wanting to force a government shutdown and defended House Republicans as willing to compromise during an evening appearance on CNN. "I think Harry Reid affirmatively wants a government shutdown," the Texas freshman told Wolf Blitzer. "The House has been working to try to negotiate a compromise, and the problem has been Harry Reid and the president." Cruz said that House Republicans have shown an ability to compromise by trying at first to defund Obamacare and then trying to only delay its implementation for one year. He also criticized Obama for being "willing to negotiate with the Iranians but not Republicans" on the budget battles. Blitzer asked Cruz what he wanted to get out of the budget crisis and pushed him to give a "real plan" for a way forward. Cruz at first relied on his usual talking points, but when pushed again said the House should pass a series of narrow continuing resolutions that specifically fund the critical services Obama warned would shut down beginning at midnight. "Let's one at a time demonstrate a bipartisan cooperation that we saw today with the military. If the president is willing to roll up his sleeves and work we can deal with the consequences," Cruz said. It appears House Republican leadership is pulling out the stops to make sure its third CR proposal passes, even enlisting the elders of the Republican Study Committee -- a caucus of 175 conservatives who often oppose leadership's efforts -- to issue a statement of support for the legislation. In a rare collective endorsement, the RSC issued a statement Monday afternoon announcing that members of the group's influential steering committee "unanimously" support the short-term funding bill, which is heading to the House floor this evening for a highly-anticipated vote. "This bill ensures that all Members of Congress and the White House will finally have to live by the same laws that have been passed, just like all Americans," RSC Chairman Steve Scalise said in a statement. "Either Obamacare is good enough that it should apply to all or it is so bad that it should apply to none. It is time for the sweetheart deals and backroom exemptions to end." The RSC's public statement of support -- some would call it a whipping effort -- comes hours after Scalise told National Journal that he would vote for the bill. By announcing to RSC members that members of the group's well-respected steering committee "unanimously" support the legislation, Scalise is openly attempting to deliver the right flank of the conference for Boehner and his leadership team. The RSC does not disclose the members of its steering committee, but several are known to National Journal, which recently published an extensive report on the group's history and current operation. Among the most prominent members of this RSC leadership group are three highly-respected former chairmen: Jim Jordan of Ohio, Tom Price of Georgia and Jeb Hensarling of Texas. Rep. Paul Ryan, R-Wisc., a longtime RSC member and former vice presidential nominee, is also a known member of the RSC steering committee, and issued a statement of support for the plan earlier this afternoon. Like a tennis champion secure in the knowledge he can safely return his opponent's volley, Majority Leader Harry Reid, D-Nev., is waiting on the House to send the Senate another amendment to keep the government running. When— if—the House does send the Senate its next iteration of a continuing resolution, Reid will move to table the measure, according to a Democratic Senate aide. It will be the third time Reid has punted back the CR to the House since Sen. Ted Cruz, R-Texas, campaigned to pressure Democrats to repeal the Affordable Care Act. This raises a question: In the Senate, home of the filibuster, why won't Senate Republicans rise up and block Reid? Aside from the potential of getting beaned with a hot political potato, there's a procedural reason. Senate Republicans won't be able to block Reid from moving to table the bill, according to Senate Republican and Democratic aides, because of parliamentary courtesy extended to Reid by the rules that allow him "first recognition," according to Democratic and Republican Senate aides. Washington's two most influential conservative advocacy groups split today on the House Republican CR proposal, with the Club for Growth backing the plan and Heritage Action for America opposing it. In a late afternoon email to lawmakers, Club for Growth VP of Government Affairs Andy Roth announced his organization would be key-voting in favor of the budget bill, informing lawmakers that the vote "will be included in the Club's 2013 Congressional Scorecard." Neither Roth nor Club for Growth spokesman Barney Keller offered an explanation of the group's support. Meanwhile, Heritage Action released a statement around the same time announcing its opposition to the House measure -- quickly adding, however, that it would not key-vote against it. "Much like the rest of Obamacare, the individual mandate and staffer exemption are bad policy, but the proposed changes would not keep the law from taking root," read a statement from Heritage Action. "For that reason, Heritage Action opposes the amendment, but will not key vote against it." Rules Committee Chairman Pete Sessions is telling Democrats to "stay calm" and get ready for a late-night deal. More on that from NJ's Billy House here. President Obama took to the White House briefing room to outline what Americans can expect if a government shutdown takes place at midnight and to offer one last plea to House Republicans to not let party politics get in the way of one of their most fundamental responsibilities. "Of all the responsibilities congress endows to Congress, two should be fairly simple: pass a budget and pay America's bills," Obama began shortly after 5 p.m. "But if the United States Congress does not fulfill its responsibility to pass a budget today, much of the United States government will be forced to shut down tomorrow." Obama rattled off a list of what government programs will continue despite the shutdown -- social security, public safety and national security services, military and border patrol operations -- before listing what Americans can expect starting tomorrow. "Office buildings would close. Paychecks would be delayed. Vital services that seniors and veterans, women and children, businesses and our economy depend on would be hamstrung. Business owners would see delays in raising capital, seeking infrastructure permits or rebuilding after Hurricane Sandy." He castigated House Republicans for attempting to use a shutdown as a bargaining chip to derail Obamacare in order to "save face after making some impossible promises to the extreme right of their party" and reiterated that the law will move forward no matter what Congress does. "The Affordable Care Act is moving forward. That funding is already in place. You can't shut it down," Obama declared. "One faction of one party of one house of congress in one branch of government doesn't get to shut down the government just to refight the results of an election." After his admonitions, Obama closed by saying he believed Congress could still strike a deal before midnight. UPDATE: 4:40 p.m. -- 7.5 Hours Until Shutdown: "We Kind of All Knew Where This Was Gonna End." Don't call Senate Republicans frustrated -- at least not those lawmakers who criticized Sen. Ted Cruz's plan to defund Obamacare through the continuing resolution. "I'm not frustrated. I'm not frustrated in the least," said Sen. Bob Corker, R-Tenn., "I think this was — we kind of all knew where this was gonna end." Corker has been one of the loudest opponents of Cruz's quest to tear down the president's signature law. Corker emerged from a closed-door meeting of Senate Republicans Monday afternoon, but declined to talk about the party's next move. Senate Republicans will decide what to do next after the House acts again, Corker said. Asked whether they considered that Reid will reject anything other than the CR the Senate sent back to the House Monday morning, Corker did not answer. "There's just not much to say," he said. As he emerged from this afternoon's special House GOP meeting, the silence from Arizona Rep. Matt Salmon was deafening. Salmon, an oustpoken conservative who 36 hours earlier said his comrades went "bonkers" after Boehner presented the second House CR plan, appeared agitated and downtrodden after hearing the third and latest iteration. Asked if he was unhappy with the plan, Salmon nodded his head yes, but refused to elaborate. Salmon was the first conservative to express unease with the new GOP proposal -- which would delay Obamacare's individual mandate by one year while eliminating health care subsidies for a wide range of government employees -- but he was not the last. Rep. Mark Meadows, R-N.C., who's played a leading role in the GOP's anti-Obamacare push, would not commit to voting for the bill when it hits the House floor this evening. Like many of his conservative colleagues, Meadows's body language was markedly different than it was Saturday afternoon, when conservatives loudly applauded Boehner's second CR proposal. "I have two objectives: keep government open, and make sure the harmful effects of Obamacare don't hurt the folks I reprsent," Meadows said slowly, measuring his words. When asked if this third proposal meets those criteria, he hesitated, and said: "I've got to look at it." When asked during a post-meeting press conference if his leadership team had the votes, Boehner nodded to Majority Whip Kevin McCarthy and said, "I'll let McCarthy talk about votes." The speaker quickly added: "We're confident that this issue will pass." The message from House leadership was that no one -- not even the president, themselves, or their staff members -- should enjoy a special exemption from the health care law. By pushing this bill, Majority Leader Eric Cantor said, Republicans are promoting "the fundamental principle ... of no special treatment for anyone." But that principle could be contributing to some tension within the conference. According to some GOP lawmakers, there was debate in the room over whether the subsidy ban would hurt their staff members and drive talent away from Capitol Hill. "There was some angst that it could hurt our staff, and we don't want to hurt our staff," said Rep. John Fleming of Louisiana. "But you know, the law's the law." Still, despite some displeasure from the right, top conservatives sounded cautiously optimistic that the bill will pass tonight -- several hours before the deadline for both chambers of Congress to reach a budget deal to avoid a government shutdown. "We'll see on the floor. Everybody's going to have to vote," said Rep. Steve Scalise, chairman of the Republican Study Committee, while stepping onto an elevator following the meeting. "I'm a yes." Health and Human Services Secretary Kathleen Sebelius told reporters on Monday that what happens in Congress won't affect Obamacare's rollout on Oct. 1. "Shutdown or no shutdown, we're ready to go," she said at a press briefing. Sen. David Vitter, R-La., spoke extensively at a press conference late afternoon about his proposed amendment, which would subject Congress to the same rules and regulations of the Affordable Care Act as the rest of Americans. A version of the amendment is in the latest House proposal. Vitter, surrounded by House Republicans and tax reform crusader Grover Norquist, touched briefly on the day's ongoing back-and-forth, speaking confidently about reaching "the finish line." Who will cross first—and when—remains uncertain. Who to blame for a government shutdown, however, won't be a mystery, Vitter said. "If in a day or two, the Democrats are refusing to continue to fund the government only because of this provision to protect themselves, then I think they will be correctly perceived for what they're doing." It's live here from the House Rules Committee. The proposal delays the individal mandate for a year, and removes health care subsidies for members of Congres, their staff, the president, vice-president, and political appointees. The committee will meet at 4:15 on the resolution. It might be important to keep a watch on a possible erosion of House Republican unity. Rep. Richard Hanna, R-New York, a centrist House Republican from the Utica area, tells NJ he's already decided he'll vote "no," doing so after leaving a closed-door conference meeting with Boehner and colleagues. And Rep. Don Young, R-Alaska said he doesn't believe the leaders have enough votes to move on any plan. Speaking on the floor after the House bill was tabled, Sen. Claire McCaskill, D-Mo., said the House Republicans aren't playing the game. There's more public support for stricter background checks for gun ownership than for repealing the Affordable Care Act, she said, but Democrats are not bringing the government to the brink of a shutdown over it. "What would everyone think on the other side of the aisle if we just decided, well, you know, we're going to shut down the government if you don't pass background checks on guns? It's what the American people want," she said. "That's not the way we legislate. That's not the constitutional framework our founding fathers put together. There would be outrage that we would try to shut down the government over background checks on guns." Democratic Sen. Chuck Schumer proposed a similar hypothetical in a post-vote press conference. What if current House Minority Leader Nancy Pelosi had held up TARP, the billion-dollar bailout program, unless Bush-era tax cuts were repealed? The New York lawmaker said such a move would have been "irresponsible." The Senate is likely to take up a measure to keep the military paid in the event of a shutdown, a top Democrat confirms. "We're not gonna leave the military hanging out," said Sen. Chuck Schumer, D-N.., the No. 3 Democrat in the Senate. UPDATE 3:11 p.m. -- 9 Hours to a Shutdown: The House GOP Doesn't Have Votes "to do Anything"
A House leadership aide says a vote on a new GOP CR with a delay on the individual mandate won't occur until tonight. Rules committee will set floor procedures sometime after 6 p.m.
UPDATE: 2:57 p.m. -- 9 Hours to a Shutdown: Harry Reid and the "Banana Republicans"
Reid all-but rejected a very short-term extension of the budget, one intended to avert a shutdown for a few days while negotiations continue over a longer bill. McConnell floated the idea earlier Monday, but Reid disparaged the plan. "The Senate's bill is a short-term extension," Reid said in his press conference following a Senate vote to reject the anti-Obamacare portions of the House's latest offer. "This is a 6-week funding bill. If we can't pass this, we are truly entering the banana Republican mindset." It is unclear whether Reid intended to say "Banana Republican mindset" or the more conventional "Banana Republic mindset." Instead, Reid called on Boehner to put the Senate's version of the continuing resolution—one which keeps the government funded at current levels and does not affect Obamacare—on the House floor for a vote, saying the votes of Democrats and centrist Republicans combined would be enough to pass it. "We are not going to do anything other than wait for them to pass our version of the CR," he said. "Otherwise, the government will shut down." The stock market is staging a gradual recovery Monday afternoon after stocks plunged at the opening of Monday trading. As of 2:25 p.m., the Dow Jones Industrial Average is still 109 points down for the day, but that represents a steady climb from the morning low, when the Dow lost more than 1 percent — about 170 points — at the opening bell. On the way into their 2 p.m. special conference meeting, House Republicans were staying mostly silent about the "rumors" of McConnell pushing a one-week clean CR to avoid a government shutdown. In fact, many GOP lawmakers said they had no knowledge of McConnell's proposal. "That's the first I've heard of it," said Rep. Tim Walberg of Michigan. Some members did seem genuinely in the dark, but it was apparent from the tone and body language of others that they were sticking to a coordinated message campaign. "Haven't seen it," said Rep. Jeb Hensarling of Texas with a broad smile. Moments later, in a separate conversation, Rep. Tom Price of Georgia echoed: "Haven't seen it." When asked about the McConnell proposal, Rep. Jim Jordan of Ohio just smiled and shook his head. The reason some members declined to speculate about the Senate minority leader's plan may have to do with conference politics. House leadership has been under pressure not to bring any clean CR to the House floor, regardless of how long it would fund the government for. With the health insurance exchanges set to open Tuesday morning, a bill that funds Obamacare for one week, some conservatives say, is just as bad as one that funds it for a year. "It's going to be very difficult to pass any clean CR," said Rep. Justin Amash of Michigan. UPDATE: 2:19 p.m. -- 10 Hours to a Shutdown: Kick Out the Staff! White House Press Secretary Jay Carney Monday said President Obama would reject a continuing resolution that repeals the medical device tax, a revenue raising portion of the Affordable Care Act. "None-of-this is acceptable," Carney said during his daily press conference. "This is just blatant extortion." Unlike other GOP proposals, such as a repeal or delay of all or part of Obamacare, repealing the medical device tax has some support among Democrats. But Democrats thus far have shown very little willingness to include any changes to Obamacare as part of the budget extension. Carney said responsibility for avoiding a shutdown rests with House Speaker John Boehner, saying he should pass the Senate's "clean" continuing resolution. Doing otherwise, Carney said anything else would mean the speaker was giving into a "small, very extreme" faction of his House caucus. UPDATE 1:54 p.m. -- 10 Hours to a Shutdown: Mitch McConnell to the Rescue? Possibly reprising his role as last-minute savior, Minority Leader Mitch McConnell is suggesting to lawmakers a one-week continuing resolution without policy riders relating to Obamacare as a way to avoid a shutdown, a Senate GOP leadership aide confirms to National Journal. "The Conference is looking at options." "Despite the Democrats' refusal to work with the House to solve the problem, Republicans are working to protect the troops, prevent a shutdown and find solutions to the difficulties caused by Senate Democrats' delays," McConnell spokesman Michael Brumas said in a statement. But Senate Majority Leader Harry Reid shot done the idea outright. Exiting the meeting of Democrats and asked if he was dead set against a one-week CR Reid said, "Yes." Senate Democrats instead have said they favor a 6-week CR that strips out the House language delaying Obamacare and repealing the medical device tax. Sen. Debbie Stabenow, D-Mich., said before the news of McConnell's offer that the Senate would vote this afternoon to send a clean CR back to the House. UPDATE 1:35 p.m. -- 10.5 Hours Until Shutdown: Sign of House GOP Fracturing? Rep. Charlie Dent, R-Pa., a co-chair of the centrist "Tuesday Group" caucus in the House, tells NJ on Monday that he will argue in the closed-door House conference expected later in the day that it is time to accept a C.R. that will keep government funded without language to delay Obamacare, and avoid a shutdown. Even if hard-liners in the conference don't think so, Dent said he believes Speaker John Boehner wants to, and that he should put such a CR on the floor. Dent says he believes Democrats and enough Republicans will pass it. He noted Boehner has already shown several times this session he is willing to buck the supposed unofficial practice of not putting legislation onto the floor not supported by the "majority of the majority." He correctly ticks off such things as a hurricane relief bill, and the Violence Against Women Act -- not to mention the New Year's vote on the fiscal cliff bill. With House Republicans set to hold a special conference meeting at 2 p.m., speculation is swirling about the possibility of House leadership presenting the option of sending back to the Senate a "clean" short-term CR that keeps the government running and buys Republicans more time to plot against Obamacare. But according to multiple senior GOP aides, there will be no discussion today of a clean CR. With the Senate poised to strip out the anti-Obamacare language from the House CR this afternoon and speedily send it back to the lower chamber, House leadership is still working with leading conservatives to decide how to respond, sources tell National Journal. There are several provisions Republicans are considering attaching to their third CR, which would be promptly returned to the Senate. These options, which will be discussed at this afternoon's conference meeting, include: a one-year delay of Obamacare's individual mandate (not the entire law); a ban on health care subsidies for members of Congress and their staffs (either in the language written by Sen. David Vitter, or some House conservatives); and a repeal of the medical device tax, as written by Rep. Erik Paulsen of Minnesota. Midnight on Monday brings two deadlines; one is for funding the government, and the other is the Federal Election Commission quarterly fundraising deadline. A barrage of fundraising pitches came from Democrats as it became clear that Congress was barreling toward a shutdown. An email from Vice President Biden asked for $3 contributions to the Democratic Party. Another from President Obama directed donations to the Democratic Congressional Campaign Committee's 2014 efforts. Republicans and conservatives have also been trying to capitalize off of the current congressional showdown. The Republican National Committee sent out its own fundraising email pitch from RNC Chairman Reince Priebus entitled "I Stand With Ted," off of the talk-a-thon of Sen. Ted Cruz, R-Texas. The Senate Conservatives Fund has been playing ads featuring Sen. Ted Cruz, R-Texas, urging people to sign a petition to defund Obamacare, and a website dedicated to the effort solicits donations. At a press conference just before noon, Sen. Barbara Boxer, D-Calif., outlined what the Senate Democrats will do this afternoon. "We're going to handle this message from the House the same way we handled the first bill," she said. This means that Senate Democrats, after a caucus meeting, will strip the Obamacare delay and medical device tax repeal from the CR and send a clean resolution back to the House. The frustration isn't just about the full delay. Boxer said that a medical device tax "has nothing to do with this particular situation that we're in now." Even if some Democrats are open for debating on repealing that tax—which would cost $29 billion in revenue over a decade—the party at this point is standing firm on refusing to negotiate on any aspect of Obamacare as part of a budget negotiation. So what happens from there, if the House just sends another CR to the Senate with Obamacare amendments? "I'm not at liberty to say what Senator Reid will do if, what, when, and how," Boxer said. The remaining shred of good will between Republican and Democratic combatants in the House all but evaporated Monday as a key Democratic legislator accused Speaker John Boehner of abdicating his authority to freshman Sen. Ted Cruz (R-Tex. ), ringleader-in-chief of the government shutdown war. "Sen. Cruz is essentially running the show in the House," Rep. Chris Van Hollen told a reporters' breakfast. "If Speaker Boehner doesn't want to exert leadership he should go ahead and turn the gavel over to Speaker (sic) Cruz." The ranking Democrat on the House Budget Committee, Van Hollen repeated that "Sen. Cruz is dictating policy in the House of Representatives today." With his leadership squarely on the line, Boehner has two choices, he added: "Either he should step aside for Sen. Cruz or he should exert some leadership."